Wikipedia says the Puget Sound is the second largest estuary in the United States. It is a complex system of interconnected marine waterways and basins that extends approximately 100 miles from Deception Pass in the north and to Olympia, Washington in the south. 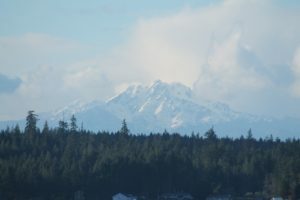 While the Puget Sound is affected by tides and is saltwater it remains a very different watershed from the open ocean. One of the primary differences is the protection from the Olympic Peninsula which forms a barrier between the coastal ocean and the Sound. This barrier offers fly anglers a rich haven for hucking flies without the crashing surf or much larger ocean swells often found on the coast. The South Puget Sound region where we guide much of the time includes all Puget Sound waters south of the Tacoma Narrows Bridge. Tidal variation increases with distance from the entrance to Puget Sound and is greatest (at 15+ feet) in the South Sound. The narrow channels and estuaries that make up the South Sound intensify these amped up tidal flows and create river like conditions which the searun cutthroat trout & several salmon species feed in. We drift these currents casting bait fish patterns to rising trout as well as casting to structure where the trout are likely to be holding. The South is the only location on the Sound that holds trout and salmon year round! The many rivers and creeks that flow into the South Sound from the mainland, islands and peninsulas create the perfect freshwater spawning grounds for the areas largest population of cutthroat trout and has developed into a truly one of a kind fishery with very little pressure. The South Sound is also home to Puget Sound resident coho. These are coho that instead of heading out to the open ocean residualize and spend their entire lives in Puget Sound. These are an absolutely perfect fly rod fish as they are aggressive, they fight hard, and are available in large numbers. A schooling fish, once you catch one you can expect to find constant action! Although not as common to catch on the fly as coho, we do encounter plenty of chinook salmon as well! Both blackmouth (resident chinook that live the same lifestyle as resident coho), as well as migratory chinook can be hooked. These fish are STRONG and fight harder than any other fish we encounter in Puget Sound. During odd numbered years there are also pink salmon returning to Puget sound. Pink salmon, while often looked upon as a lesser species when comparing fish as table fare, are an incredible fly rod fish! They generally return in big numbers, are eager to eat a fly, fight hard, and can provide non stop action! Many people, locals included, will tell you that Puget Sound is a 7 to 8 month a year fishery, that simply is not the case. Fly fishing the South Sound in the winter months of November through February is some of our favorite times to fish! The lack of bait fish, cooler water temperatures etc. finds the South Sound trout waiting for anything resembling food to swim by. The winter months can actually be some of the most productive SRC fishing of the year, and this is also prime time to catch hard fighting, aggressive resident coho salmon! The best part of fishing during the winter is there is very little angler pressure anywhere on the water! Spring months provide fantastic cutthroat fishing, especially during the annual chum fry outmigration. This event occurs in the spring time as chum fry enter Puget Sound from the small streams/creeks and begin their journey to the ocean. Cutthroat and salmon both feed on these fry and it can create some incredible fishing! The resident coho salmon are getting larger by this point as they have been feeding heavily all winter and are starting to put on weight. Summer through fall provides some fantastic cutthroat fishing, as well as the option to target larger migratory salmon as they travel through Puget Sound on their way to their spawning streams. The resident salmon are also reaching very respectable size and by late summer can be caught up to 10 lbs. COME JOIN US FOR A DAY ON A WORLD CLASS FISHERY. WHERE THE BACKDROP TO EVERY CAST IS MORE BREATHTAKING THAN THE LAST! Please feel free to give us a call or drop us an email with any questions you have about gear, times to come, access, lodging or anything else that will help you plan your trip to the South Puget Sound. South Puget Sound Fly Fishing. That’s what it’s all about!